Children with cancer and blood disorders attending the Amazon Robotics Camp and tour included, David Hermosa of Sebring, in front of Page Bell of Palmetto and Bo Wade of Northwood. Amazon employees welcoming the youngsters were, back row, from left, Donnie Iorio, Tania Sadde and Jose Soto, all of Riverview, and Trisha Nesse-Wyssbrod of Apollo Beach. The Amazon Fulfillment Center in Ruskin did more than just ship packages all over Florida and the country last Friday. 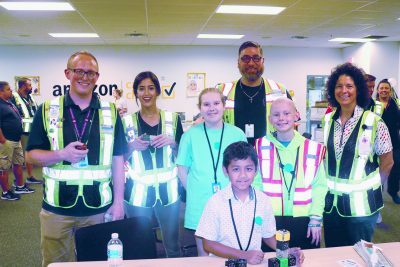 The online shopping delivery company lifted the spirits of children battling cancer, and donated $10,000 to a St. Petersburg-based hospital “so every child will have an opportunity to pursue their passion.” Wide smiles of amazement and happiness appeared on the children’s faces as they participated in a tour of the Amazon facility and, later, built their own robot race cars with the help of Amazon employees. 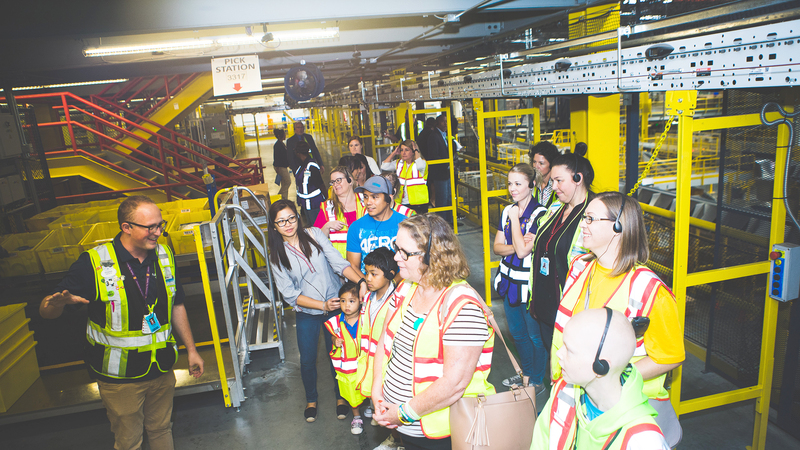 Amazon hosted the children from Johns Hopkins All Children’s Hospital and their families at their fulfillment center for Camp Amazon, a hands-on robotics day camp at the gigantic Ruskin facility. The experience was part of Amazon’s month-long national campaign, Amazon Goes Gold, to raise awareness around childhood cancer. The children, who are interested in science, technology, engineering and math (STEM), participated in hands-on STEM activities, including building and testing their own robot race cars. 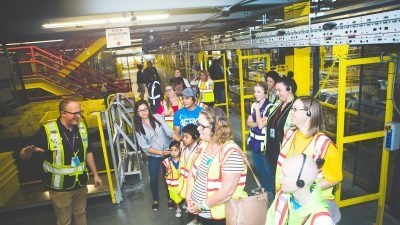 They were treated to a behind-the-scenes tour of the center and watched how Amazon associates work alongside robotics to pick, pack, and ship customer orders. Each child took home a small box of STEM toys. The Amazon fulfillment facility in Ruskin hosted several children who are battling cancer and blood disorders for a tour of the facility and a robotics camp. Amazon donated $10,000 toward the fight against childhood cancer, the leading cause of death by disease for children in the U.S. According to the American Childhood Cancer Organization, childhood cancer is the leading cause of death by disease for children in the United States, yet there’s a disparity between the amount of federal funding for childhood cancer research and adult cancer research. This event is one of eight that will take place at Amazon’s fulfillment centers across the country during September. • Childhood cancer does not discriminate. • In the United States, the incidence of cancer and cancer among adolescents and young adults is increasing at a greater rate than any other age group, except those over 65. • Although great strides in treatment and care have been made, childhood cancer is still the number one disease-killer of children in the U.S. The Amazon Fulfillment Center in Ruskin employs about 2,500 people. It opened in September 2014. The structure between Ruskin and Sun City Center on I-75 encompasses the size of 28 football fields, has enough steel to build two Eiffel Towers, and its conveyor belts, lying end to end, would stretch 10 miles. A similar, smaller Amazon facility is in Lakeland.